When the weather started to clear up, husband and I drove to Red Wing, MN. It’s a lovely small town bordering Wisconsin. 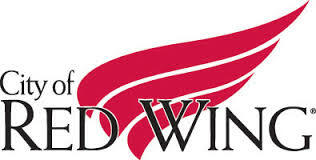 It’s the home town of Red Wing Pottery and Red Wing Shoes and a whole lot of other businesses called Red Wing, accompanied by a drawing of a red swan wing. Sometimes this wing is hand drawn and detailed, other times it’s a sharp minimized vector drawing, but it’s always the same red wing. I get it, it’s the name of the place, but HOW AM I SUPPOSED TO TELL EVERYONE APART IF YOU ALL HAVE THE SAME LOGO? I took the liberty to design some red wing related logos that stand out more. Please use them, it’s free. Red Wing has some successful businesses, this is very impressive for a small town. What would make this town even better is their very own fast food chain. The name is just ASKING for it! So because the same animal is being used for the wing logos I wanted to use the coolest animal with wings EVER. The Pterodactyl. I did not see a museum of natural history or any trace of paleontology in Red Wing so I came up with a club. I suggest all the smart asses in Red Wing come together and start this club. You know, those people who call a tomato a fruit. Yeah. This club is for them. This one is for all the teenagers living in redwing who are too young to drive. What do underage bored teenagers do? Thats right, they start a metal band! This one is for you little metal heads!